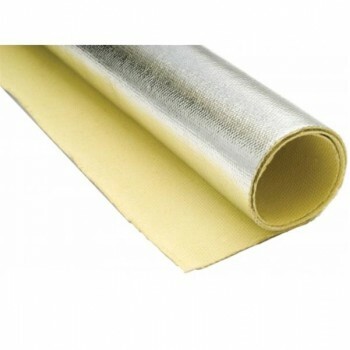 Thermotec Kevlar Heat Barrier 26" X 40"
Home » Thermotec Kevlar Heat Barrier 26" X 40"
The Kevlar Heat Barrier is made from Kevlar with a Mylar finish. The Barrier can withstand up to 3000deg F of radiant heat and can withstand direct contact up to 1100deg F.
The product can be installed using standard rivets with a backup washer or weather strip adhesive. The use of clamps or straps such as our Snap Straps can be used to hold the blanket in place for applications on manifolds or exhaust systems. In applications such as a heat shield on the undercarriage above the exhaust the material should be held in place by fasteners as decribed above. When used as a heat shield, the barrier is installed so the bright metallic surface faces the heat source. When used to retain heat in applications such as exhaust manifolds, the barrier is installed with the fabric side facing the heat. This allows the metallic surface to act as a barrier to prevent the penetration of liquids. Ask a question about Thermotec Kevlar Heat Barrier 26" X 40"